Heads up: A ten-minute Whole30 summer meal comin’ your way: Watercress with Seared Prosciutto and Peaches! I’m not kidding—this simple salad takes NO. TIME. AT. ALL. 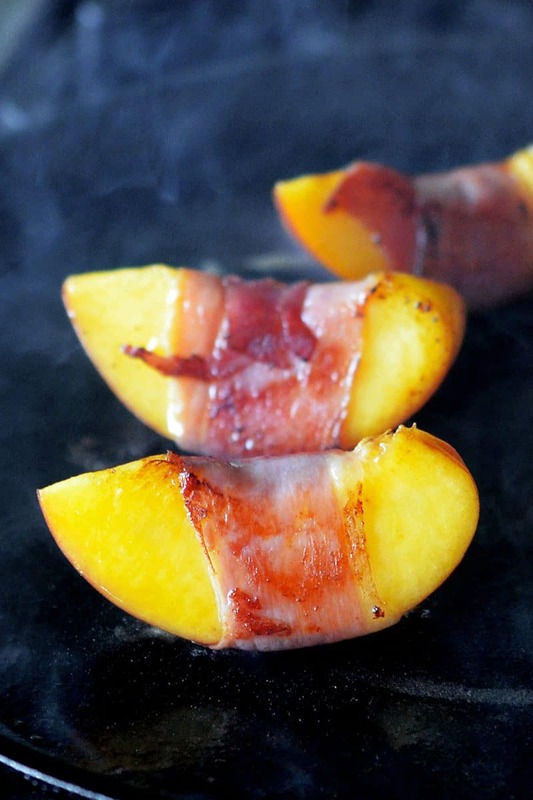 Prosciutto-wrapped peaches on a bed of bitter greens is a classic Italian starter that I used to order every time I spotted it on a summer menu…’til it finally dawned on me that this dead-simple recipe can be made at home for pennies on the dollar. Yeah, I can be dense sometimes. It took this old dog a decade to learn this peachy new trick, but hey: better late than never, right? Once ripe peaches made their first appearance of the year at the local farmers’ market, I started making this savory, sweet, and assertive summer salad on a regular basis. Can you blame me? I mean, the hardest part is just wrapping prosciutto around peach slices! Plus, I’ve replaced the usual bed of arugula with watercress. Why? ’Cause she’s the new Queen Bee of the vegetable aisle (that’s right: move over, kale), and I’ve been doing my darnedest to incorporate this nutrient-packed powerhouse into my diet. 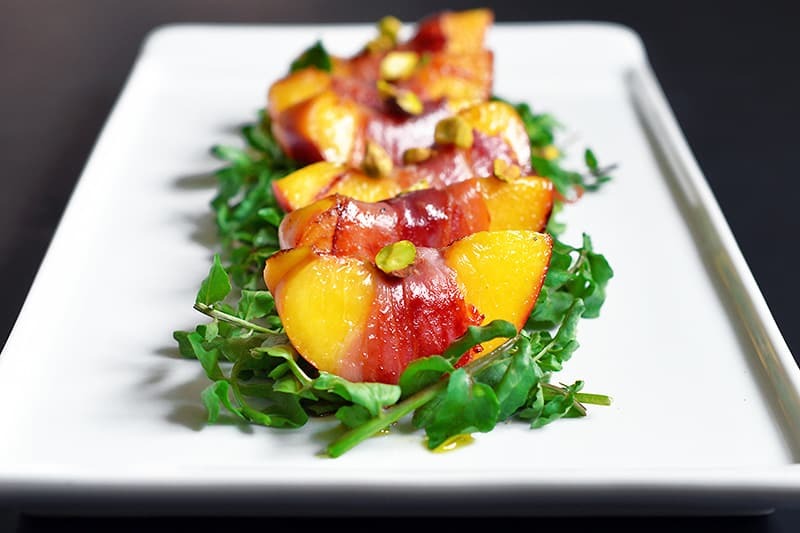 The warm peaches wilt the watercress slightly, making each mouthful a kaleidoscope of flavors and textures. What do you say? 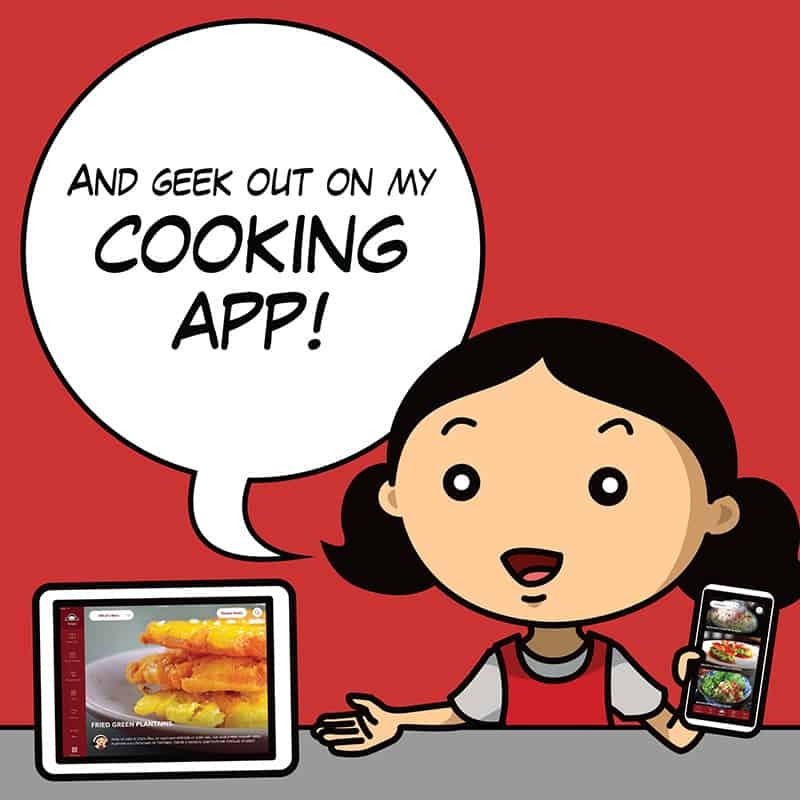 Ready to try your hand at my favorite summer salad? 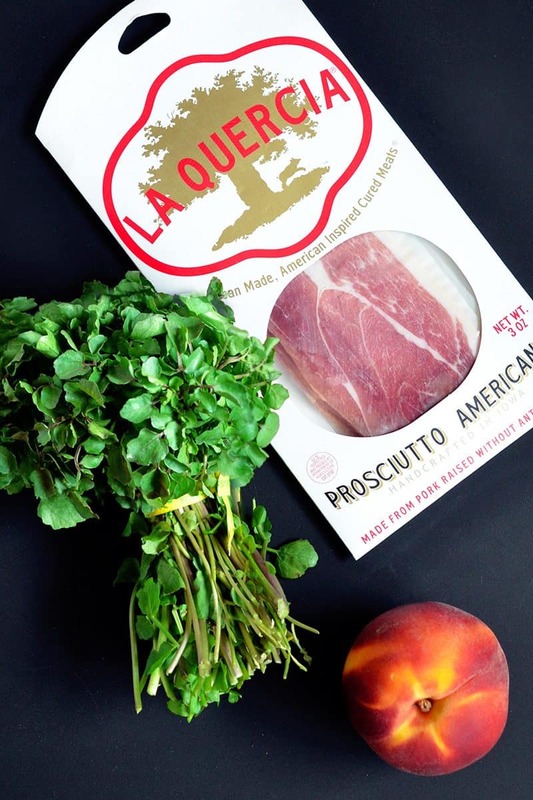 Let’s make Watercress with Seared Prosciutto and Peaches! Wash and spin dry the greens before dumping ’em on a plate. Slice your peach in half, remove the pit, and divide each half into thirds to get six slices. 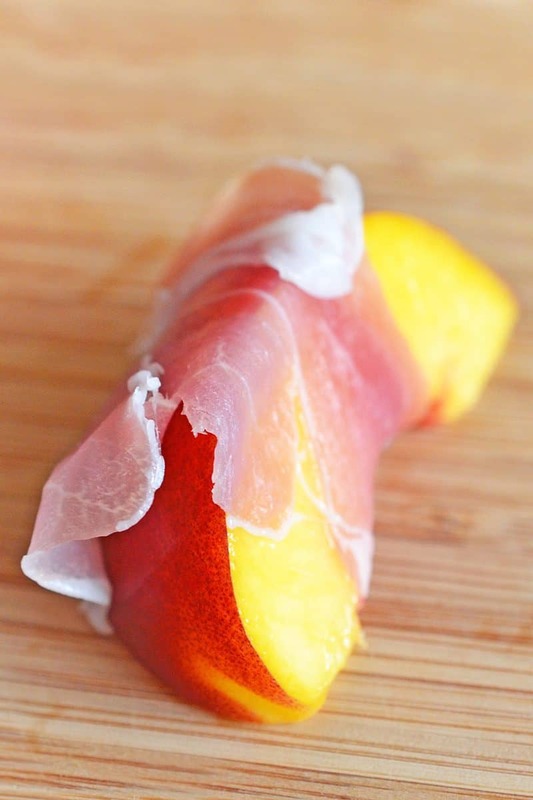 Wrap a slice of prosciutto around each wedge of fruit. 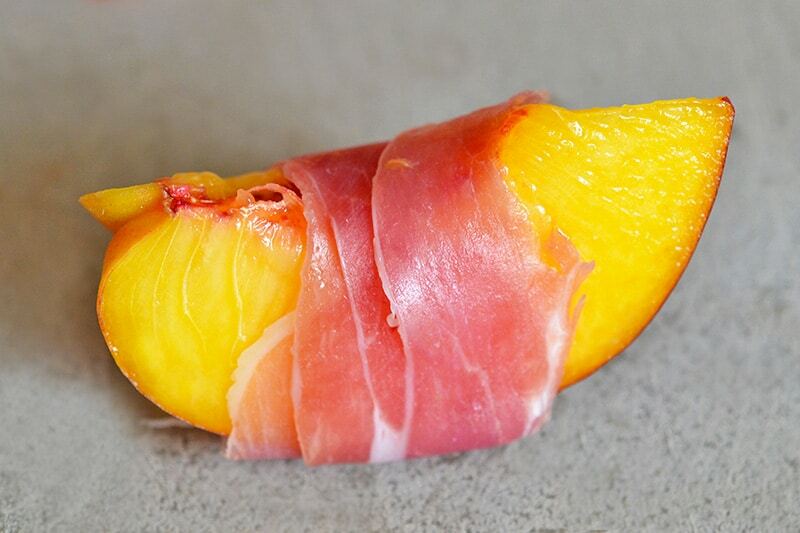 The prosciutto should be coiled flat and tight around the peach slice. 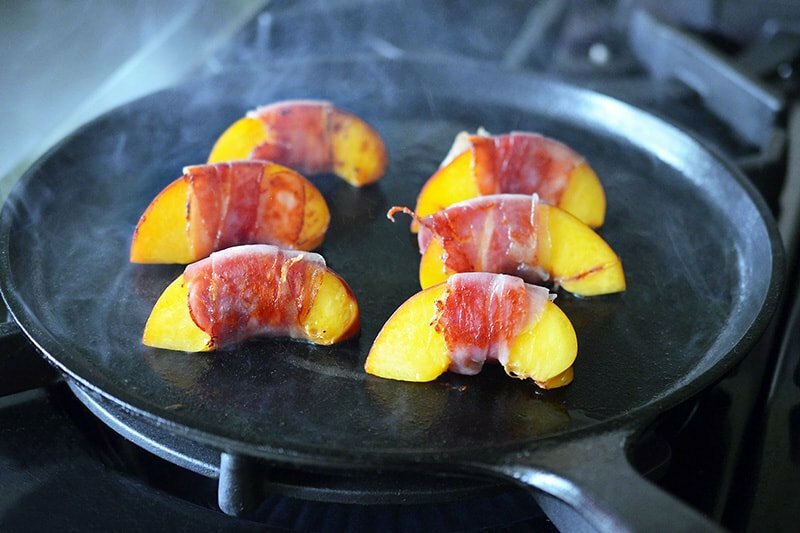 While you’re preparing the peaches, heat a skillet or griddle over medium-high heat. Add the ghee or avocado oil, and swirl to coat the pan. When the pan is hot, lay the peaches on one side and cook for about a minute or until browned. Then, flip each wedge over onto its other flat side, and cook for another 30-60 seconds. When the peaches are browned on both sides, flip them peach-skin side down. and brown the bottom for 30-60 seconds. 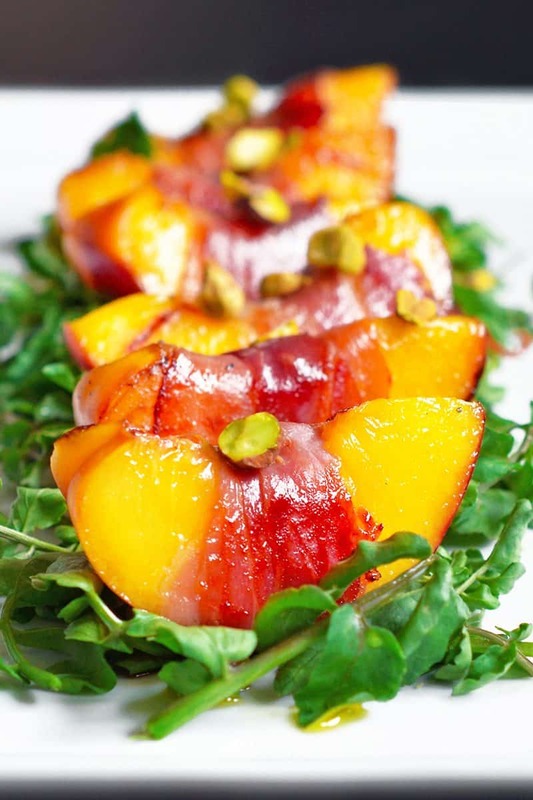 Place the hot peaches on the bed of watercress. 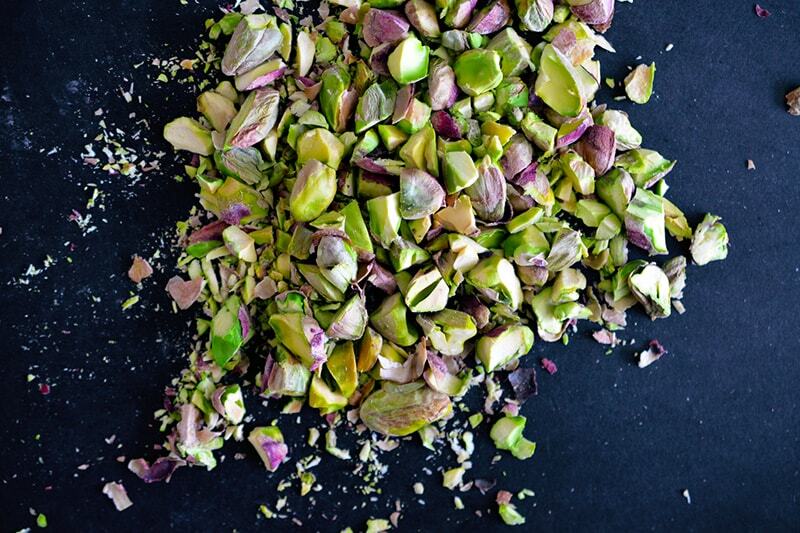 Chop up the pistachios and sprinkle on top of the salad. Add a generous drizzle of extra virgin olive oil and balsamic vinegar to taste, and top with freshly cracked black pepper. Look! It’s summer on a plate! 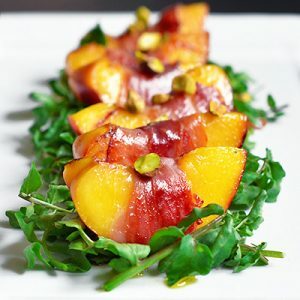 Heads up: A ten-minute meal comin’ your way: Watercress with Seared Prosciutto + Peaches! 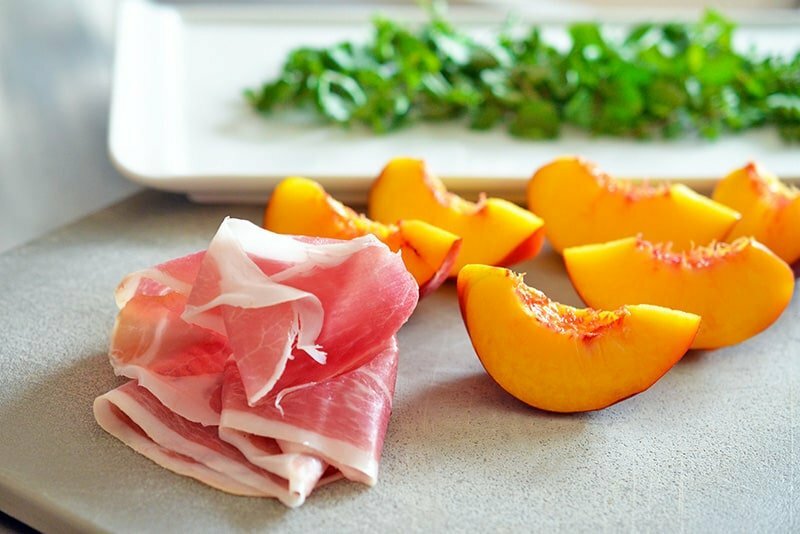 Prosciutto-wrapped peaches on a bed of bitter greens is a classic Italian starter that I used to order every time I spotted it on a summer menu…’til it finally dawned on me that this dead-simple recipe can be made at home for pennies on the dollar. 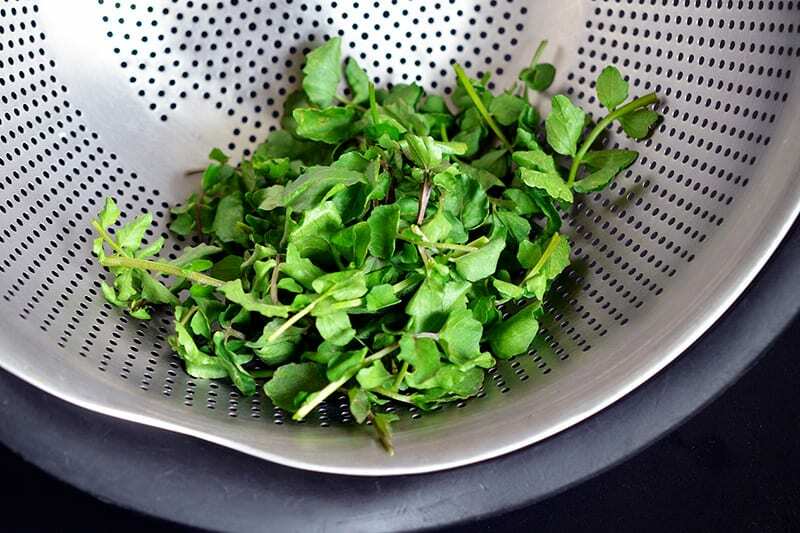 Grab a big bunch of watercress and pick off the tender leaves and thin stems until you have 2 cups of salad greens. (Reserve the rest to add to soup. Like Simple Egg Drop Soup!) Wash and spin dry the greens before dumping ’em on a plate. 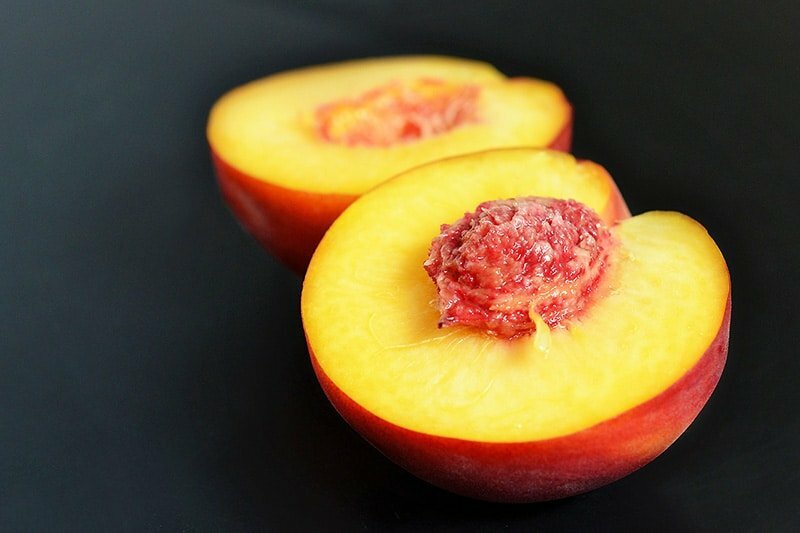 Slice your peach in half, remove the pit, and divide each half into thirds to get six slices. Wrap a slice of prosciutto around each wedge of fruit. The prosciutto should be coiled flat and tight around the peach slice.